The first semester is over, and Saga Fellows are halfway through their year of service. Time has flown by! This month, we caught up with Jeffrey Antoine to hear about the Saga experience from a first-year Fellow’s perspective. 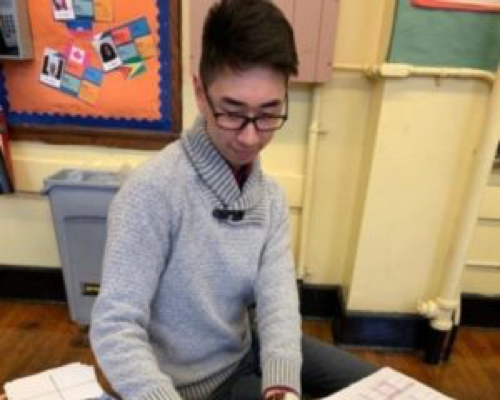 Jeffrey is currently a Saga Fellow at Abraham Lincoln High School in Brooklyn, New York, and is passionate about closing the achievement gap through education. Q: What was your background before joining Saga? A: I am originally from Los Angeles and went to Case Western Reserve University in Cleveland, Ohio, where I majored in Spanish and psychology. Originally my plan was to go to grad school to become a psychologist. But my parents accepted my interest in teaching professionally. I was especially interested in teaching immigrants and refugees because I had built a strong relationship with family’s housekeeper, who helped raise me. After seeing the achievement gap and poverty that faced her family, I was motivated to help in some way. SAGA’s mission and the opportunity to provide students facing similar circumstances support aligns with my goals and values for the future. Q: Why did you apply for Saga Fellowship? A: I’m familiar with the concept of young teachers moving on because they don’t have the support or strategies to manage the difficult challenges that are characteristic of many classrooms in a low socioeconomic community. I wanted to dip my toes in the water, so to speak. As a Saga Fellow, I would be working with a maximum of four students at a time. It was the best option for me to figure out if I wanted to pursue this path and contribute to the achievement gap in this way. Q: What has surprised you most about being a Saga Fellow? A: I came in with some expectations that were met and not met. At the high school where I tutor, students come from a variety of backgrounds and many have fallen behind in their grade level. I grew up in an affluent, predominantly Asian community and I was used to academics being the focal point of my life. That wasn’t always the case in this school. But the students are willing to pay attention during lessons. There’s a bond between student and teacher that motivates them to learn that I didn’t really think about when I first became a Saga Fellow. That’s the biggest surprise: how willing the students are to learn in spite of their previous track record of not meeting the expectations the state has set for their math lessons. Q: What has been one of your most memorable experiences in Saga so far? A: I had a student who I knew was very bright. He was able to contribute to the discussion, but he wasn’t consistent. He’d perform highly some days and other days he’d struggle to stay awake. After talking to him, I learned that he didn’t eat breakfast or lunch, and he also had trouble sleeping. I made suggestions like anyone would: Try bringing an apple or a granola bar. I thought this was a simple solution, but the pattern continued. I finally asked him if there was something preventing him from bringing food. He said he couldn’t ask his parents for the supplies to make a sandwich to bring to school. I told him I would make a sandwich for him for lunch because it’s important to his success that he’s able to focus. He was surprised that I followed my word the next day, and also grateful. Sometimes the only thing holding you back is not having the resources to perform at the level you can. Q: What are some pieces of advice you can offer incoming Saga Fellows? A: One of our tenets here at Saga is “roll with it.” Be flexible. Having expectations can help to an extent, but be prepared to improvise or take a different approach for different students. And be willing to recognize limits of your own wisdom. You may attribute certain behavior to a previous experience, but it’s important to look beyond initial assumptions and engage in a dialogue. There might be different reasons for people to behave and interact with the world the way they do. It can really make all the difference to the students when you try to get on their level and communicate to understand them as an individual.